Torminalis liquid food supplement for infants with caraway and dill. Children from 4 weeks to 6 months old: one teaspoon (5 ml) up to 5 times a day. 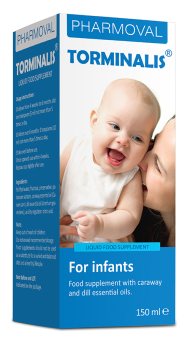 Children over 6 months: 2 teaspoons (10 ml) up to 5 times a day. Once opened use within 4 weeks. Consult your pediatrician before using product. Not allowed if fructose sensitive. Do not use if cap is broken or damaged. If there is any sign of an unexpected reaction, seek medical attention.